Heading into the 2017 season, we believed that Ryan Fitzpatrick was best suited to be a backup quarterback, mentoring a youngster. So when he landed in Tampa Bay behind developing star Jameis Winston, it seemed an ideal gig for him. 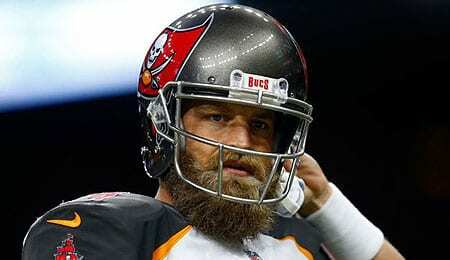 Fitzpatrick was solid in his role last year, but with Winston suspended for the first three games of 2018, the bearded veteran has quickly reminded the football universe that it wasn’t that long ago that he enjoyed some decent seasons as a starting quarterback. We’re talking about a smart player that’s proven he can be a leader, although he’s been plagued by inconsistency over his career. Thanks to some early season Fitzmagic, he’s become one of the top Fantasy waiver wire picks heading into Week Three. Hell, did you see what this dude wore to the postgame press conference? All Fitzpatrick has done so far is complete 21 passes for four touchdowns in a Week One shootout win in New Orleans, and then come home and nearly match his excellence in beating the Super Bowl Champion Eagles, 27-21. He’s the first QB in Tampa Bay history with back-to-back four-TD games. We’ve never seen him look this good, by a long shot. Fitzpatrick is playing to Tampa Bay Head Coach Dirk Koetter‘s mentality by throwing deep downfield at will. With a Week Three matchup a home against a very suspect Steeler defense (that allowed a Patrick Mahomes-led offense to generate six scores), Fitzpatrick has one final shot to make his claim that he should keep the starting QB job once Winston returns for Week Four. There are a few things to remember about Fitzpatrick. He’s been at his best in his career in September, and he’s always been better at home. Other than Saturdays, he saves his worst showings for Mondays, and he’s played poorly in five career games against the Steelers. The idea that Fitzpatrick is suddenly an elite pass caller may be very difficult to wrap your head around, but if the Bucs believe in him, that’s all that matter, right? For his part, he’s just there to win football games (see video below). If nothing else, think about this: with four touchdown passes of 50 or more yards through his team’s first two games, Fitzpatrick tied Joe Namath’s NFL record, set 46 years ago. Winston owners should be very, very worried. Now it’s your turn. Let us know in the comments below how you think this Buccaneer quarterback situation will play out. Start ’em, Sit ’em: Malcolm Floyd to the Rescue? December 18, 2014 | by Josh Johnson | Comments Comments Off on Start ’em, Sit ’em: Malcolm Floyd to the Rescue? We always knew Floyd was quality WR. Injuries have thwarted him in every season until this one — in which he is averaging 17.3 yards per reception. Now fellow WR Keenan Allen is done for the year. Floyd’s role should increase, which might hurt his average, but a TD seems very likely for this veteran with underrated athletic skills. Posted in FOOTBALL, Josh Johnson, Ken LeBlanc, Start 'em Sit 'em | Comments Off on Start ’em, Sit ’em: Malcolm Floyd to the Rescue? He is a big gamble who will provide spurts of excitement and Fantasy owners will gleefully outbid each other for him. Unless you are in a league that rewards for return yards, leave Archer be, we say. The market always crashes. The Wire Troll: John Beck Making Progress in D.C.
October 25, 2011 | by Buck Davidson | Comments Comments Off on The Wire Troll: John Beck Making Progress in D.C. Injuries have played a huge role in shaping the Fantasy football landscape this season, and this week the Washington Redskins took an especially hard hit, losing both their top runner and receiver to maladies that will sideline them for an extended period. The backfield situations in Arizona and Denver are also in flux, so opportunities for waiver-wire wizardry abound in these three locales. Elsewhere, many quality players may be sitting on your league wire as a result of being dropped for their bye weeks; be sure to have a close look and make that claim if you see a player that can help your Fantasy cause. Posted in Buck Davidson, FOOTBALL, The Wire Troll | Comments Off on The Wire Troll: John Beck Making Progress in D.C.